There are 5 members in the Govan Network. Members enjoy meeting up together on a regular basis. They usually meet up in the Pearce Institute in Govan and make use of the MacMillan Café. 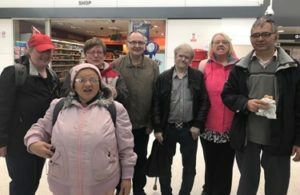 Members of the Govan Network enjoy getting involved with local craft café which is run by Impact Arts who often have displays of their work at various events in the community. Members in Govan also enjoy drama and have been lucky enough to attract students from Glasgow University to run drama sessions giving members the opportunity to build their confidence. One member from this network currently sits on Neighbourhood Networks Board. The network members enjoy having fun and have developed great friendships over the years. There are 7 members in the Springburn Network. We have recently had some new members join the network which has been great. Members meet regularly for network meetings where they plan things to do. Members enjoy meeting once a month in a pub in town for a bite to eat and a quiz they also have a book group where they read different books. 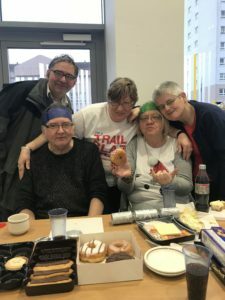 Springburn members also enjoy travelling to different networks in other areas if they have something on like a Ceilidh or a fundraising event. One of the members from this network also sits on Neighbourhood Networks Board. Springburn and Govan members also get together regularly and are good at supporting each other.